Spam. It’s the cause of nightmares and cold sweats for online communities big and small. For some time, SpeakerRate operated with little interest from people looking to get quick SEO ups for websites selling Gucci bags and Air Jordan shoes. Sadly that time came to an end, and an all out war had begun. After working through many different anti-spam measures, we believe we’ve finally won the war and can continue on with our lives mostly free of hearing from our Gucci bag friends. Because our new measures tend to be on the “stricter” side, we thought you, the user, should know about them. Speakers who belong to a specific talk will be able to post links on that talk freely. This should allow for speakers wishing to answer questions or to give more information the ability to do so through links. A whitelist of accepted, legitimate sites that can be linked to is also allowed. We’ve started small by evaluating sites already linked to on SpeakerRate and will continue to grow this list as the community increases in size. These measures have worked to plug the black hole of spam with very few problems of catching legitimate comments. If your comment gets marked as spam, you can easily send us a request to approve it, and we’ll get it up on the site. What’s more, when your comment is marked as not spam, the URLs included in it are automatically added to our whitelist. We understand that our system is not flawless, but we will continue to make it better and less restrictive. 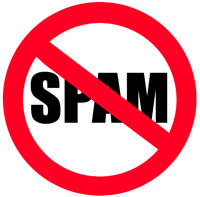 We think a world with no spam is a good world. So goodbye Gucci bags and Air Jordan shoes. We won’t miss you.